DT2-30 Double Boom JumboDescription of DT2-30 Double Boom Jumbo: Double boom jumbo is a kind of two boom underground drilling jumbo machine typically used in tunneling construction of mining, metallurgy, water and electricity, railway, highway engineering, etc. It can work on surface of the tunnel, roof, side and floor. The double boom jumbo can not only drill the blast hole, but also drill the bolt hole easily. DT2-30D Double Boom Jumbo for Steep SlopeIntroduction of DT2-30D Double Boom Jumbo: Combined with borehole and blasting, double boom mining jumbo drill can cooperate well with muck loaders. 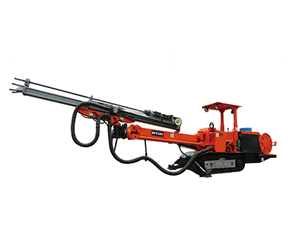 DT2-30 hydraulic underground crawler drilling jumbos are composed of drill booms, rock drills, hydraulic systems, and so on. Besides, optional configurations are offered to improve working performance. This jumbo offers a good working condition for operators. The double boom jumbo is a kind of two boom underground drilling jumbo machine typically used in tunneling construction of mining, metallurgy, water and electricity, railway, highway engineering, etc. It can work on face of the tunnel, roof, side and floor. 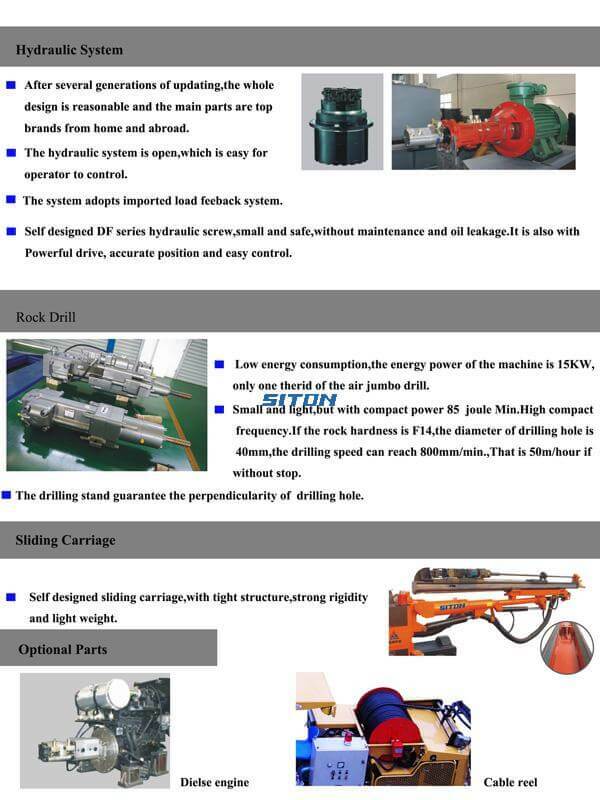 In addition, the double boom jumbo can not only drill the blast hole, but also drill the bolt hole easily. 1. The double boom jumbo, owning a drilling speed of 0.8-2 m/min, can work with high efficiency. 2. This underground drilling jumbo machine has an advanced hydraulically controlled drilling system which is safe and simple to operate. The system incorporates the auto stop and anti-jamming function, which make sure that the machine can stop automatically at the end-point and wash itself automatically. 3. It can walk flexibly with direct diesel drive which can transport materials at a long distance. 4. The double boom jumbo has a low center of gravity, great mobility and remarkable stability. It is specially suit for the tunnels of big section. 5. Possessing a line of rock drills, drill jumbos and roof bolters, the double boom jumbo can drill the rock with a much lower cost per meter.